: Board Collector: Mark Richards USA. 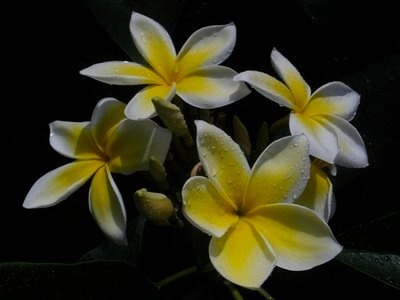 Part 2 Hawaiian connection. 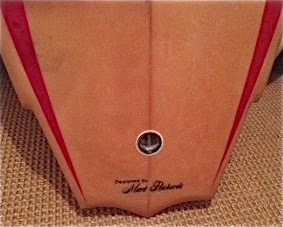 As if the prove the expression "it never rains it only pours", this remarkable example of a 1978 Mark Richards twin fin, shaped in Hawaii, has recently shown up on eBay. 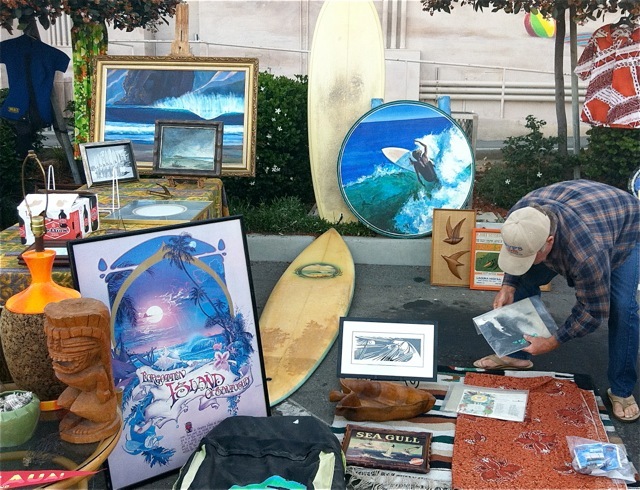 One day later it was sold. 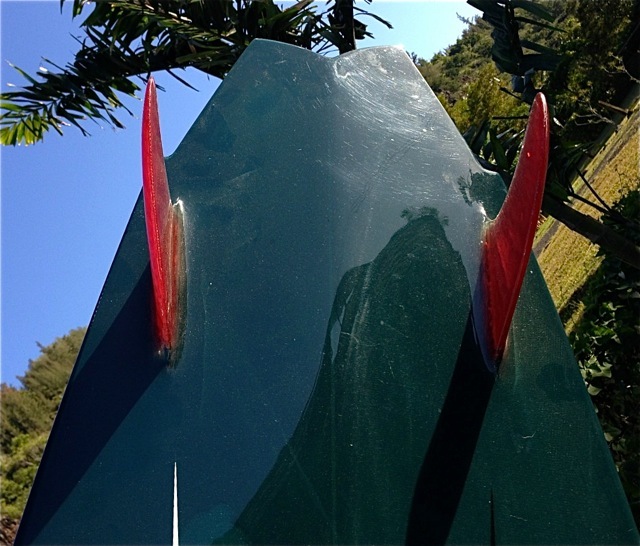 The weird thing is I swear I saw it not long ago on Craigslist somewhere near Big Bear in California, unrestored. 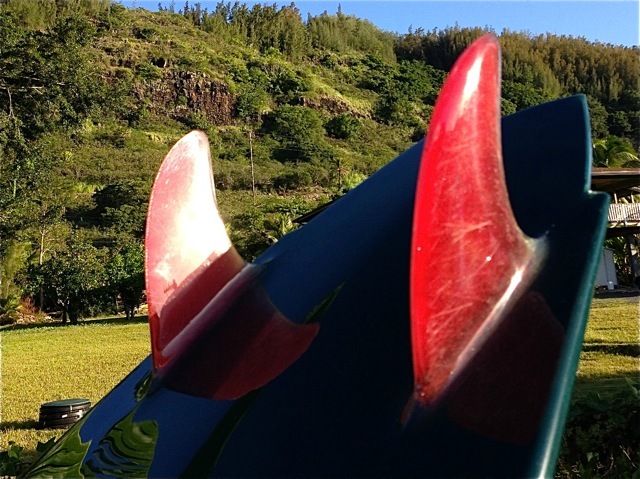 To me this has got to be one of the most desirable twin fins ever made, the history, the color , the pin lines, the outline and tail set up, the shaper, the decals. 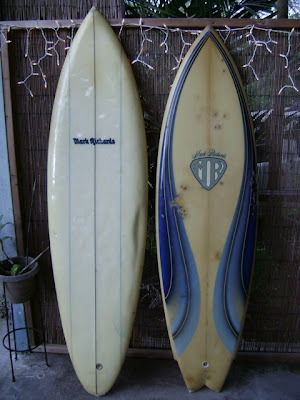 How many times have you seen an original Mark Richards shaped late 70's Hawaiian made twin fin with Lightning Bolt and MR superman decals come up for sale? 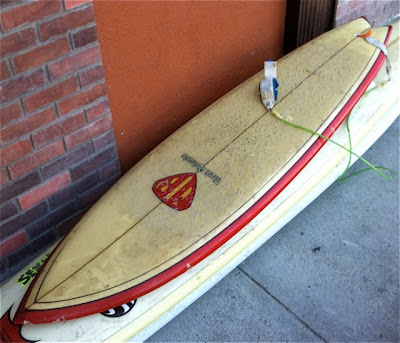 Which reminded me of this incredible little find from the Longboard collectors club meet at Oceanside recently. 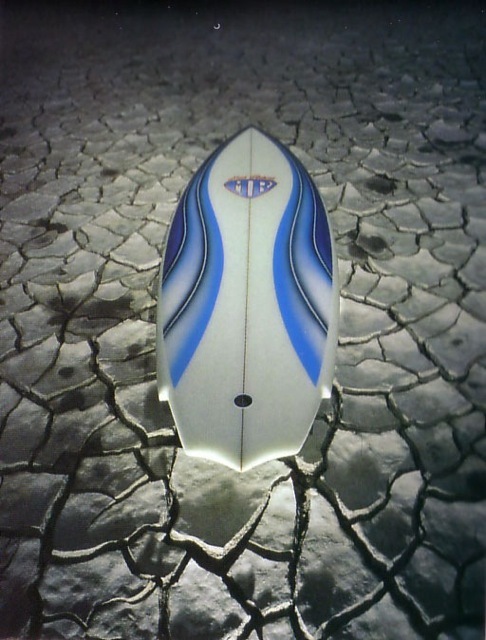 I was told this was only the second MR twin fin ever made in the US at the G and S factory in San Diego. 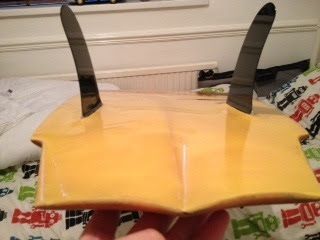 It was given to a G and S team skateboarder, which would make sense and explain why its still in such good condition. Then I got a message from Simon in the UK with pics of what I believe is a US made M.R twin fin based on the logo on the deck (so I could add it to this post Mark Richards USA) , although it could be a Vitamin Sea MR model. 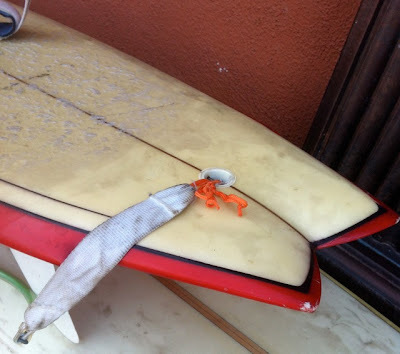 He writes- "Hey mate, found your blog - great site. I follow the UK vintage site. I notice your a fan of twinnies. Here is my M.R. From approximately 1981, I brought back from Trinidad 12 yrs ago. It had one white star fin and a beach side bodge job. 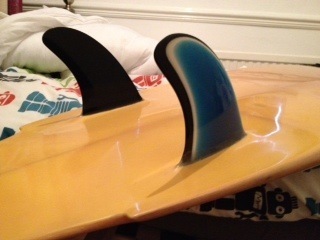 I just had sympathetic restoration done ( still looks like an old board should!!) 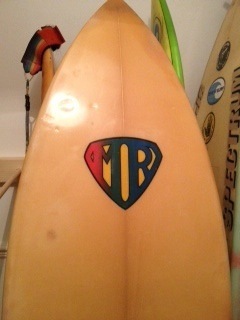 and had some M.R 78's glassed on - it flies - notice the bat wing tail." Indeed I did notice the bat wing tail, as its very similar to my Australian made Bob Margets shaped MR twin fin from the same period. 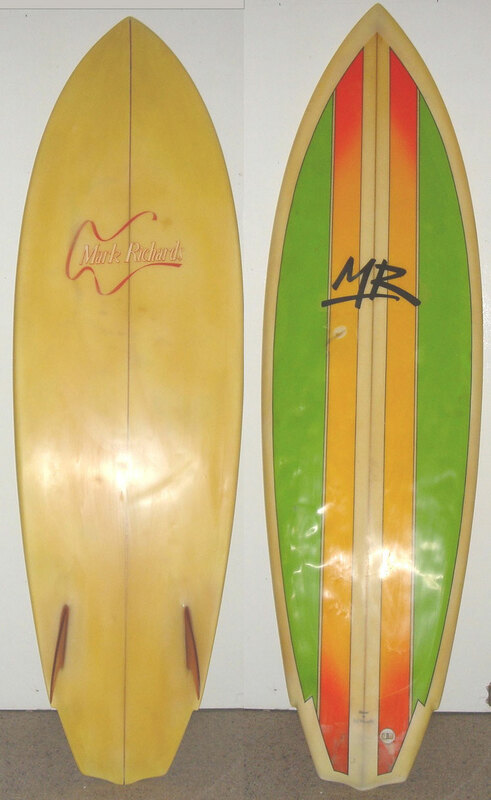 As I posted on the other thread, I have an MR board shaped by Pat Rawson with Mark in Hawaii circa 1991as a prototype bonzer double concave. An interesting bit of shaping history? 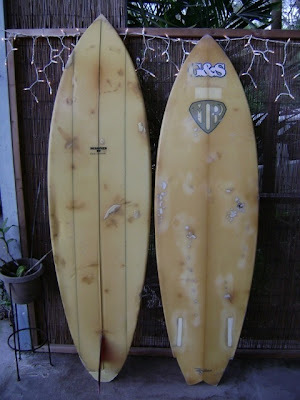 Oh, back when I bought the board either in late 91 or early 92, I also got one of Marks own Hawaii guns. It was a 7'8" tri with "Hawaii 91" on the stringer. Unlike the Rawson MR 7'2" it still had a classic v bottom. 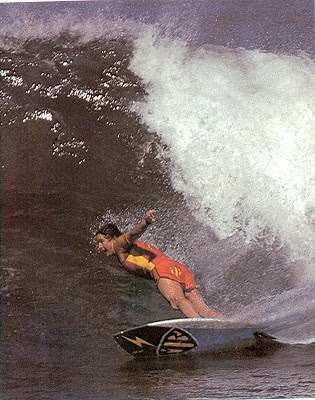 Given though most shapers then started to use the double concaves it shows how influential Pat was? If I do sell this board I am seriously considering getting a 1978 MR "Free Ride" replica twin for riding: not display. I still trust those v bottoms and a forward wide point!